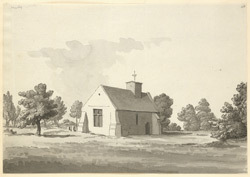 A north-east view in ink of Harby church in Leicestershire. Harby is mentioned in the Domesday Book, and its owner is identified as Robert de Todeni, standard-bearer to William the Conqueror at the battle of Hastings. The book notes that the village at that time had fourteen ploughs, an important means of calculating tax in the 12th century. At the time Grimm made this drawing, a good deal of land around the village was owned by the De La Warre family. Lord De La Warre was the first governor of the American state of Virginia in the 17th century and gave his name to the northern American state of Delaware.